In this quick guide, we’ll show you how you can get access to American Netflix from the UK. People choose to do this as the USA has by far the most TV Shows & Movies available on Netflix. First off, to actually watch Netflix from other locations, you will need to use a VPN. Which stands for ‘Virtual Private Network’. It essentially spoofs the location of your device, making websites and applications believe your in a completely different location. Originally, you could browse Netflix with any old VPN that you could find online, even for free. However, a large crackdown was done on VPN’s and most don’t work anymore, even a lot of paid services. There are very few providers who still specialise in Virtual Private Networks that hold support for Netflix. Before we look into watching American Netflix from the UK, you should know that you will in fact need a VPN. I’ll cover below which one I currently use and have success with. So as we discussed before, getting American Netflix from the UK requires a Virtual Private Network. One that specifically works great is NordVPN. We discussed NordVPN when looking at the best VPN for Netflix not too long ago. You can read more about what VPN’s are in that post. $11.95 billed every 1 month. $3.29 billed every 12 months. $5.75 billed every 6 months. To start watching American Netflix, simply boot up the program, either on your Mobile phone, Laptop or even smart TV. Simply select the location you wish to browse from, which in our case is America and click connect. 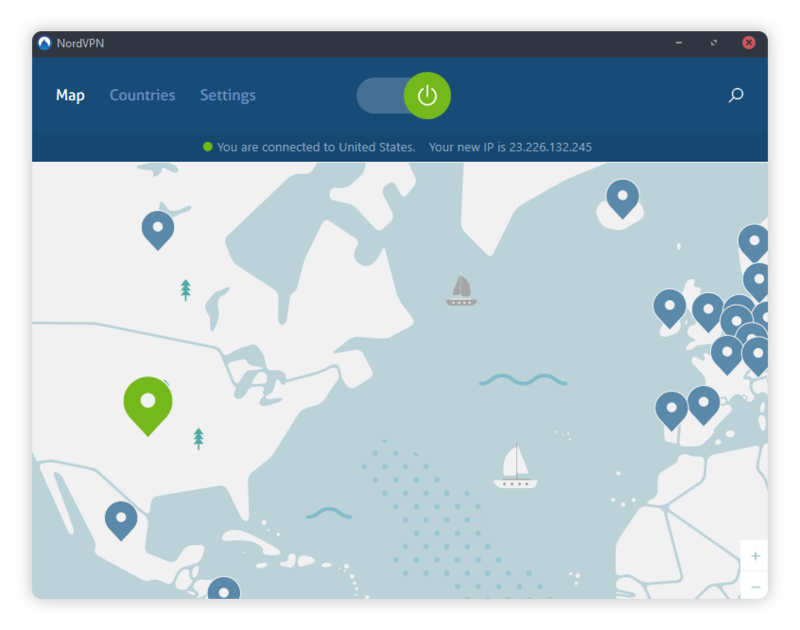 NordVPN will automatically choose a server which it thinks will work best. However, clicking the ‘Countries’ button at the top allows you to choose from hundreds of other potential servers. According to the FaQ of NordVPN, you are allowed a maximum amount of 6 devices connected to the VPN. This means you can watch American Netflix through NordVPN on your Laptop, Computer, Tablet or even phone. The devices that can be used are endless. Another feature provided by Nord VPN include CyberSec. What CyberSec does is protect your device from malware, viruses, advertisements and botnet’s. If you ever find yourself accidently accessing a website which may be unsafe, there’s no need to worry as NordVPN will check against a live list of potentially harmful sites and prevent access.